On December 15, SRI International launched the Ionospheric Scintillation Explorer (ISX) - a miniature satellite on a space-weather mission. According to Hasan Bahcivan, Ph.D, research physicist and SRI principal investigator for the ISX mission - The understanding for the life cycle of these turbulent patches is quite limited, as we lack means to regularly probe their 3D structure. To date, we have little insight into how far the disturbed patches extend along Earth's geomagnetic field and have limited options to adapt the communication systems to operate within these regions. Dr. Bahcivan's novel approach for the ISX investigation is to examine thousands of digital terrestrial television (DTT) channels known to penetrate the patch regions for evidence of signal corruption. Because the powerful ground-based DTT transmitters have fixed locations and stable operating frequencies, they form a global network of signals ideally suited for imaging the internal structure of the disturbed ionospheric patches. As the ISX orbits, it will receive signals from multiple DTT transmitters to form a 3D image of emergent disturbances, an observational technique similar to a medical CAT scan. The SRI International ISX receiver is installed in a 3-liter miniature satellite (CubeSat) designed by students at the California Polytechnic State University, San Luis Obispo. 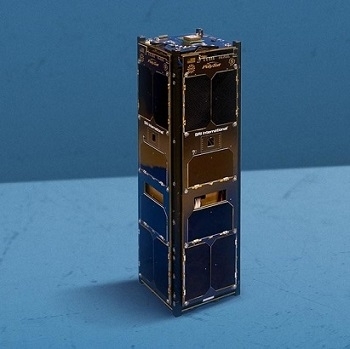 The CubeSat is the eleventh spacecraft designed at Cal Poly and is the eleventh space research mission launched since 2008 with support from the Atmospheric and Geospace Sciences division at NSF.